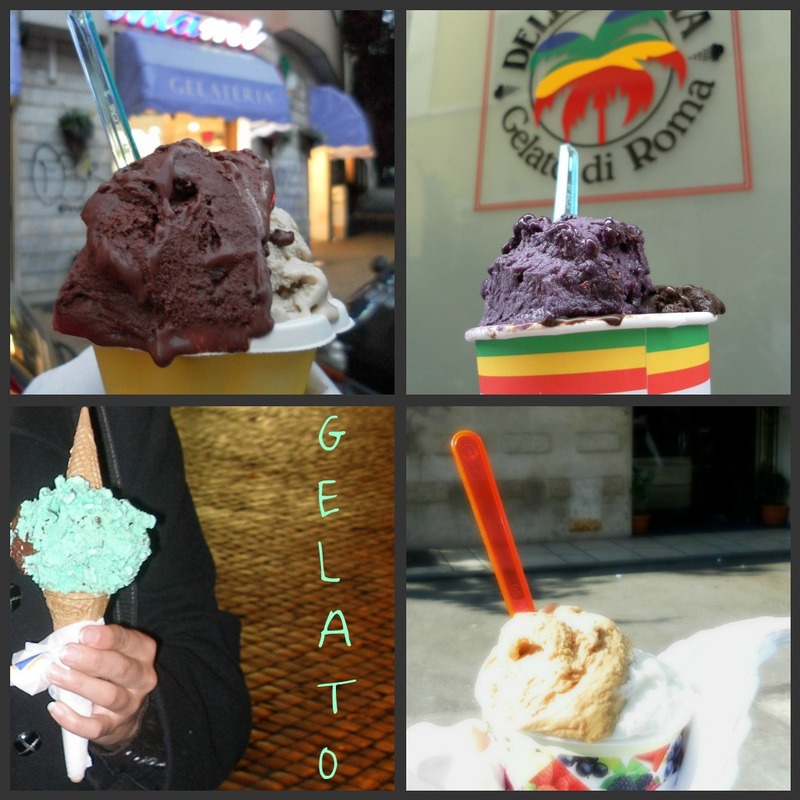 Living like a tourist: I Piaceri d'Italia: Gelato! I am bringing out the big guns with this one. Gelato. Arguably the best of the small pleasures of Rome. Put it in the Colosseum with its two noble competitors, coffee and wine, and I am not sure which would win. Or which I would route for, for that matter. But Gelato is world-reknowned as one of Italy's great offerings. How could a dessert that traces its origins back to volcanic ice smothered in honey not have evolved into a spectacular treat? And you no longer have to traipse up Etna or Vesuvius to get your fix. Gelaterie are as widespread in Rome as pigeons in Venice's San Marco's square. It is good for you! Ok, well maybe that is going a bit far, but it is better for you than ice cream. Gelato typically has more sugar than ice cream but less butterfat (4-5% vs. 13-15% for ice cream). The sugar content however is what keeps gelato from melding into the solid brick of frost-bitten congealment that most ice cream containers become in our freezers. During the churning and freezing process, ice cream has up to 50% air added to it, while gelato only has up to 25-30% air added, resulting in a denser product with a richer flavor. While ice cream, because of its high fat content can be stored for months, gelato will only keep its texture and flavor for a few days. So quality gelato needs to be made regularly and in small batches. On average gelato has fewer calories than American ice cream. Add that in Rome you normally walk to get to the gelaterie as opposed to drive and you have all the reason you need to savor the thick, velvety, soothing mouthfuls of this wonderous dessert. The overly adventurous of you out there who might like to attempt creating gelato artiginale, this is a fabulous site that can help not only with your cooking but with your Italian. Tucked away in the residential area of Monteverde, it is worth the trek for the pistacchio-flavored gelato, one of my favorites. I will also admit that famous/infamous Giolitti also has an amazing pistacchio, but I can't be bothered to fight the tour groups for this treat... for their granite di frutta, however, that is a different matter. Also a neighborhood favorite, this gelateria is strategically well-placed to end (or begin) a day of shopping on Via Marconi, behind Stazione Trastevere. I tend to find some more exotic, kid-friendly flavors here like Smarties, bubble gum, and other brightly colored treats. I wish I could say that the crowds and commercialism of this particular gelateria, if not its drastically reduced portions, have turned me away from this particular spot. However, I cannot. In my many, many, many explorations of gelato around the city, I have yet to find a place that does cioccolato fondente (molten, dark chocolate) better. Alas, as this is my absolute favorite flavor, I stay loyal to Della Palma despite the ridiculous lines, chaotic masses and touristy location. My admiration also extends to their offering of flavors, close to 100, and to their fruit flavors, such as mora (featured above) that couldn't taste any more like the fruit than if it were a bowl of mashed blackberries, in this case. I will likely add to this list, as my hunt for gelato is ceaseless. However, this is a good start. Should you have an opinion on gelato (and come on, we all do), please let me know!